Survivor: One World (2012) - 12th place, 7th out - 1st juror. Voted out in Episode 7, "The Beauty in a Merge" (Day 20). One World Ep. 4 RC: "Coco Connection" - Jonas (a.k.a. Jason) connects on one hit, but Manono loses. One World Ep. 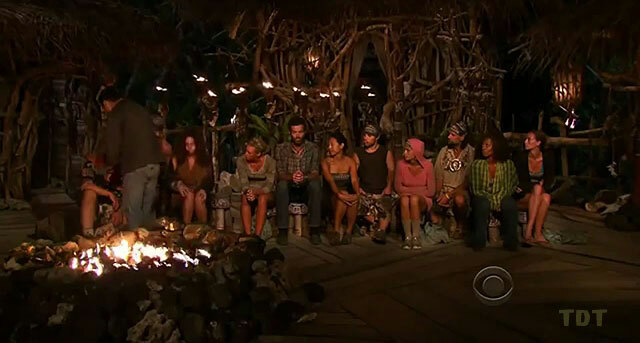 4 IC: "Puzzle Relay" - Jonas sits out, Manono wins, but they go to tribal anyway. One World Ep. 5 RC: "Dear Liza" - Gets stuck on new Manono, and they lose to Salani. One World Ep. 5 IC: "Basket-brawl" - Another loss for the old, slow, tiny new Manono. One World Ep. 7 RC: "Sea Turtles" - part of yet another losing team (with Kim, Leif, Tarzan, Michael, Kat). One World Ep. 7 IC: "Roller Ball" - Out in third round (of three, 5th/12). One World, Ep. 7: Ten votes, from Kim, Sabrina, Chelsea, Christina, Alicia, Tarzan, Kat, Troyzan, Jay, Michael (voted out, 10-2). Gordon Holmes at XfinityTV.com (3/29/12): "Castaway Interview: Jonas Otsuji"
Rob Cesternino at RHAP (3/29/12): "Kiss the Cook Goodbye: An Interview with Survivor Jonas Otsuji"
Daniel Fienberg at HitFix.com (3/31/12): "Jonas Otsuji Talks Survivor: One World"
"Jonas says: My strategy is no strategy. Think on your feet and go with the flow. I want to gain trust. But when I need to cut that (by lying) in order to further myself, I will do that. Jeff says: Jonas is very malleable. At some point, Jonas is going to have to say, 'This is my alliance, and I'm going stick with them and hope it works out.' Otherwise, people are going to see him as too soft or too nice and just cut him loose." "Personal Claim to Fame: Making a name for myself as a Sushi Chef two years after going bankrupt and losing everything. Why You Think You'll "Survive" Survivor: I know how to fish, make fire, shelter and cook amazing food. Why You Think You Will Be the Sole Survivor: I believe I could be the final Survivor because I have a proven track record of doing what I set out to achieve. I can make fire, build shelter, cook and get along with people to win their votes."